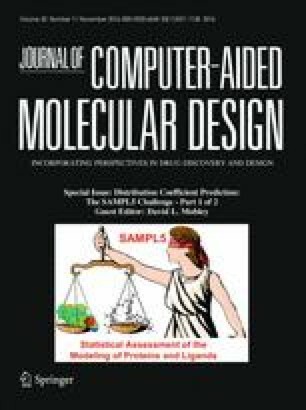 We present the performance of blind predictions of water—cyclohexane distribution coefficients for 53 drug-like compounds in the SAMPL5 challenge by three methods currently in use within our group. Two of them utilize QMPFF3 and ARROW, polarizable force-fields of varying complexity, and the third uses the General Amber Force-Field (GAFF). The polarizable FF’s are implemented in an in-house MD package, Arbalest. We find that when we had time to parametrize the functional groups with care (batch 0), the polarizable force-fields outperformed the non-polarizable one. Conversely, on the full set of 53 compounds, GAFF performed better than both QMPFF3 and ARROW. We also describe the torsion-restrain method we used to improve sampling of molecular conformational space and thus the overall accuracy of prediction. The SAMPL5 challenge highlighted several drawbacks of our force-fields, such as our significant systematic over-estimation of hydrophobic interactions, specifically for alkanes and aromatic rings. Ganesh Kamath, Igor Kurnikov, Boris Fain and Leonid Pereyaslavets have contributed equally to this work. The online version of this article (doi: 10.1007/s10822-016-9958-4) contains supplementary material, which is available to authorized users. The authors are grateful to the organizers and participants of SAMPL5 for arranging this competition on distribution coefficients, which enabled us to test our in-house software and assess our force-fields. We also would like to thank Anthony Stone for a beautiful and succinct way of visualizing potential maps  that inspired us to do the same. We are also thankful to everyone else in our company (in particular Meredith Robert) for supporting our participation.